Dr. Natasha Smith – D.C.
Why should a child get their spine checked by a chiropractor?Doctors of Chiropractic work with reducing spinal nerve stress by correcting spinal misalignments. Since the master control system of the body is the nervous system, its proper function is imperative for overall health and well-being. Children are susceptible to trauma in their spines from various activities and events. Birth in our society can often be a traumatic event, even if operative devises are not used. Routine force applied to the baby’s head and neck can cause damage. Simple micro traumas from diapering techniques to excessive time in infant seats can also affect the developing spine and interfere with nerve system function. The resulting interference to this vital system decreases their bodies’ ability to function normally.Although symptoms, such as pain and malfunction may not show up for years, injury affecting their vital nervous system may be present immediately and have a lifetime of damaging effects. When should a child get their spine checked?Ideally, children should be checked right after they are born because birth can be very traumatic to the baby’s spine and skull. Even the most natural births are traumatic to the infant and may cause “hidden damage”. With specific chiropractic adjustments, these children experience a greater quality of life and health. It is important to realize that the absence of symptoms does not indicate a healthy spine and nervous system. 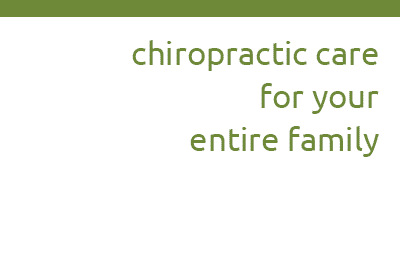 Only routine checks by a Doctor of Chiropractic can determine if the child’s spine needs care. Early detection and correction of spinal misalignment with chiropractic prevents accumulated damage to children’s developing nervous systems and has lifelong benefits to their overall health. Children typically respond very well to chiropractic care and often require less care than adults. After the child’s first check-up it is often recommended to re-check them at certain life milestones such as rolling over, sitting up, crawling, standing etc. Will the adjustment hurt my child?Chiropractors use very specific and gentle techniques when working on children. In the very young, the adjustment is as light as a finger touch. Infants often sleep through their adjustment and older children willingly relax and enjoy the care. How do I know where I should take my child? All Doctors of Chiropractic are licensed to care for children. In the family oriented chiropractic office you will find Doctors who have expanded their interest and abilities to work with children. Dr. Kelly is an active members of the International Chiropractic Pediatric Association (ICPA) and has taken post-graduate classes on specific techniques for pregnant mothers, infants and children to enhance her skills in this field. The above information has been modified from www.makinmiracles.com written by Dr. Jeanne Ohm Executive Director for the International Chiropractic Pediatric Association (ICPA).